Plans for this holiday season changed, completely, after attending the last season of the Osborne Family Lights display and coming away with some MWM recordings. I'd hoped to finally start working with pixels and E1.31 this year but it turned out there wasn't time to do that and also dive into the MWM recordings that had I'd just obtained. In the end, the MWM recordings won out. The first challenge to be addressed involved the various MWM devices, themselves. My test area is a corner of the living room. But with the arrival of the holidays, those items didn't fit the holiday decor. Either they needed to move elsewhere (there is no elsewhere) or they needed to morph to fit in with the holiday theme. So morph it was. The final products sufficiently fit with the holiday decor and allowed the work on the recordings to continue. All household inhabitants were content with the outcome and I got to continue doing my thing. Some of the modifications were trivial. Some of the changes to the devices are reversible. Some are not. All are examples of how it's possible to 'Bring Magic Home' and enjoy it in ways not particularly intended by the good folks at Disney, but in ways that fit with our own needs. I'm hoping that some of you reading this post will have additional examples that you'll share so we can encourage others to keep the innovations rolling and help popularize these great devices. This reimagining took little imagination. First time I saw this device I thought it looked more like a vase than a cup, anyway. Making that transition was quick and easy. The cup liner was removed, some artificial poinsettias, etc were purchased from Dollar Tree and plunked in the outer device. There are multiple stickers reminding that the outer portion of the device is not intended/suitable for holding liquids. So fresh flowers are out, unless you can come up with a more suitable cup liner to replace the original Disney themed cup liner. 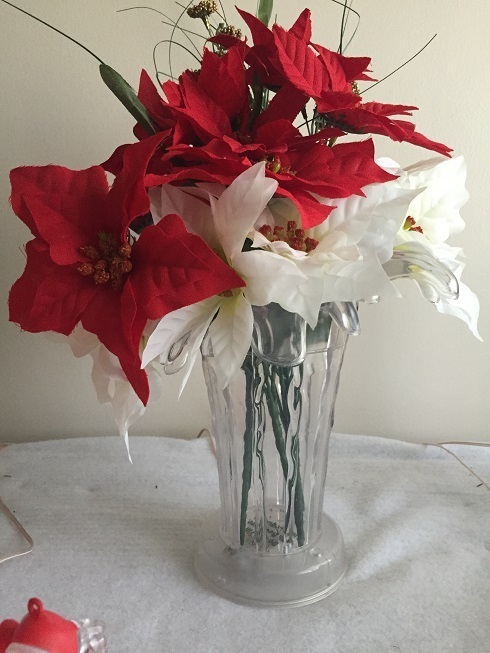 Artificial flowers worked fine for me and were very affordable sourced from Dollar Tree. To keep from having to disturb the setup to replace batteries, wires were attached to the battery terminals and run to an external bench power supply (aka old computer power supply) and run off the 3.3V rail. Done. Arranging the 'flowers' such that the white ones were the lowest and draping those over the lip of the sipper cup helped to pick up the lights from the LEDs. Even if you don't want/intend to connect the device to anything but battery power, it's still a good idea to run wires out of the device to an external battery holder where it's easier to replace batteries without disturbing the display. I found this out early on. Clearly, this modification is easily reversible. Simply remove the 'flowers', reinsert the liner cup and lid, remove any wires attached to the battery terminals, insert batteries and you're good to go. After Christmas, simply rotate the 'flower' choices to reflect the season. I'm already looking ahead to roses and Valentine's Day.